Study the vocabulary below and then watch the video. When a volcano erupts, it explodes inside and flames, rocks, and lava come out of the top. e.g. The volcano erupted with tremendous force. authorities [plural] : people who have power to make people obey rules and laws. e.g. Local authorities are investigating the accident. If you are stranded somewhere, you are left in a place without a way of leaving it. e.g. Hundreds of passengers were left stranded at the airport. If you fling something, you throw it in a sudden and forceful way. (fling-flung-flung) e.g. They flung their hats into the air. When you take shelter somewhere, you go to a place in which you are protected from bad weather or danger. e.g. They took shelter in a cave during the storm. If you resume an activity, or if it resumes, it begins again or continues after stopping e.g. After the rain stopped, the teams resumed play. At least 30 hikers are feared dead in Japan after being found at a lifeless state near the peak of a volcano that erupted a day earlier. Japanese authorities never confirm death until after a medical examination. Others were injured or are missing. This amateur video was taken inside a mountain hut as people took shelter from volcanic ash and rocks. 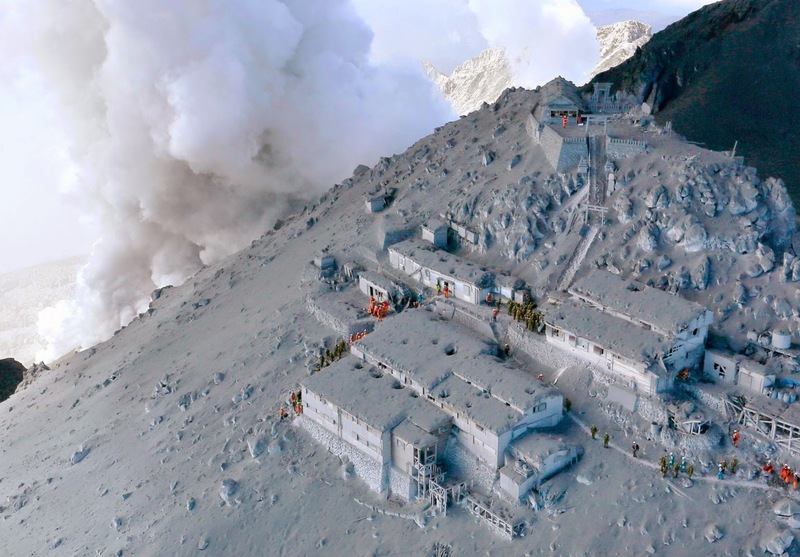 Hundreds of people including children were stranded on Mount Ontake, some 200 kilometres west of Tokyo, after it suddenly erupted on Saturday. Smoke and ash was flung hundreds of metres into the sky, and several kilometres down the slope of the volcano. More than 500 emergency staff including the military resumed their work on Sunday morning, helping stranded victims and looking for those still missing. At one stage on Saturday some 250 hikers were stranded on the mountain but most managed to make it down by nightfall. More than 30 people spent the night in mountain huts, most of whom came down on Sunday morning. Volcanoes erupt periodically in Japan but until this weekend no one had died for more than twenty years.